Hello friends, I hope you had an amazing Thanksgiving yesterday. I hope you were able to celebrate with friends and family. I truly hope you were able to make new memories with one another this year. I have a Thanksgiving post coming up. I wasn't able to work ahead this year due to other commitments from the non-profit I'm apart of and work. So, my pie recipe will have to wait til either Saturday or Sunday. I'm reallllly excited to continue making these vision boards for you guys. When I make these, I tend to have a person in mind. For this one, this has my youngest sister, S, all over it. She's definitely our little traveller. She's been more places than me and is always up for a new and fun adventure. If that sounds like someone in your life, this is the post for you! one // Bite Beauty Agave Mask is the best and only lip mask I use. This mask is my saving grace and I don't travel without it. Its best applied before bed. It not only hydrates but also smoothes your lips until they're fully recovered by morning. It's an absolute miracle. It's spendy, I won't lie, but I've had mine for over a year and I've barely hit the 1/2 of the tube. I've mentioned it in this post and this post. 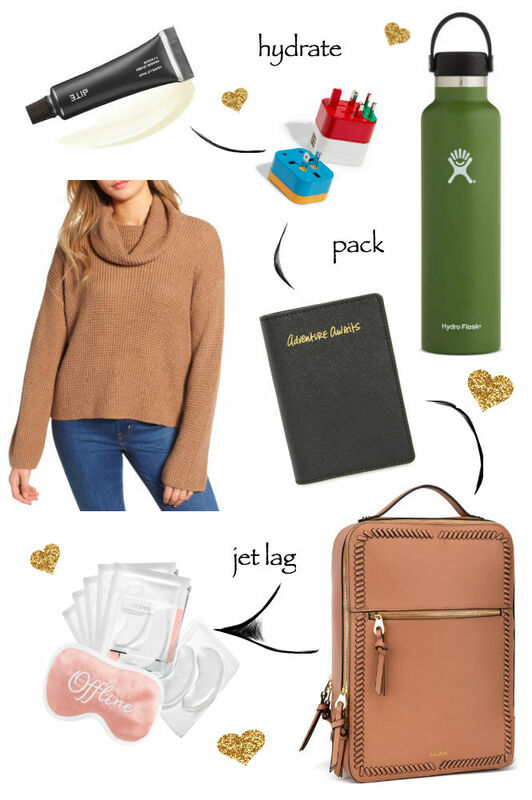 two // Traveling to other countries can be stressful, especially when you're going to multiple places in one trip. My sister always packs her 5-In-1 Universal Travel Adapter when abroad and she loves it because it has multiple options with a mere twist or pull. Honestly, everyone needs one. three // I take my Hydro Flask everywhere. Everywhere. When I don't have it, I'm lost and I definitely don't drink enough water. I convinced my brother one of my sisters to invest in one. They're now asking for a second Hydro Flask that's strictly for work. I'm about to buy another as well. 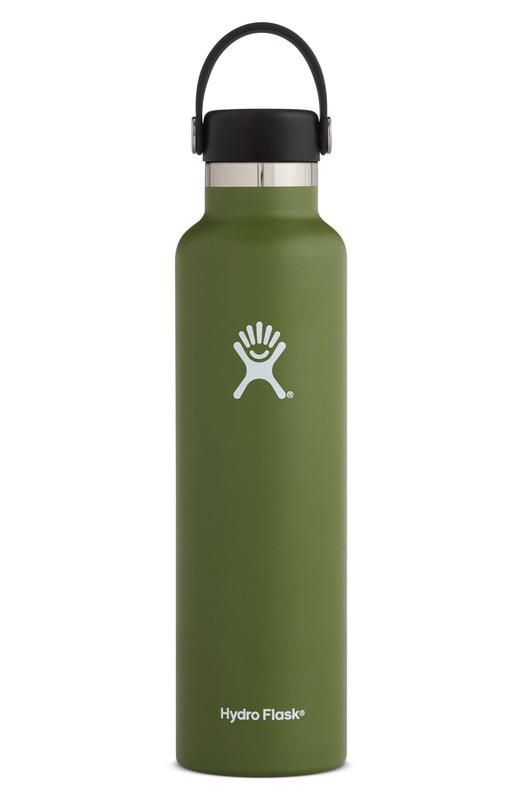 I have the 40oz and it's great for road trips to Portland and hiking but this 24-Ounce Hydro Flask is the perfect carry-on item. No one will ever regret getting a Hydro Flask. four // Recognize this sweater? I loveeee my Bp. 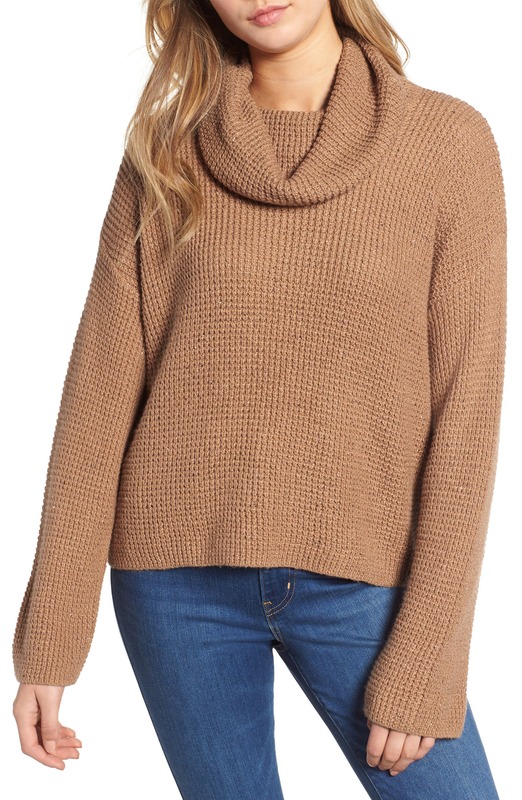 Chunky Thermal Cowl Neck Sweater and I swear my sister is on the verge of stealing it at any moment. I wore this sweater while I was in San Francisco last week and in a post last month while at Starbucks. Coming under $50, it's a steal and great for the plane. five // Passport holder. 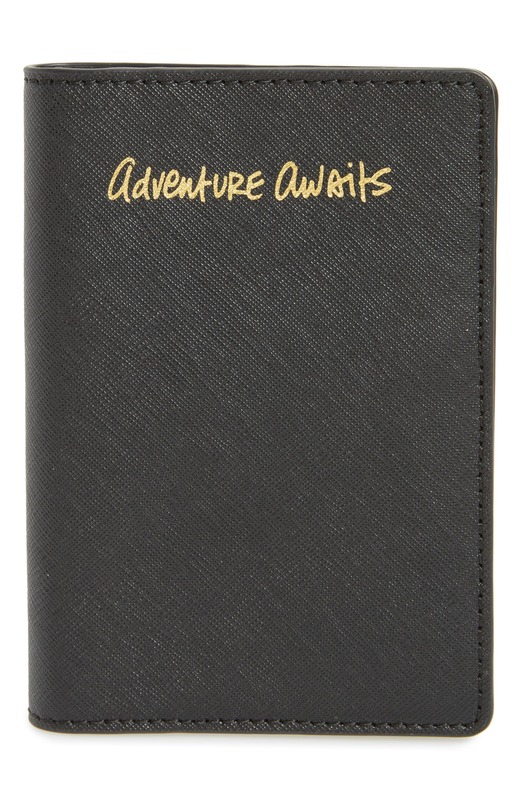 You literally can't go wrong with a passport holder and this Leather Rebecca Minkoff Passport Holder checks all the boxes for your traveling friend. Not only is it a great price for the material but it'll last years and the "Adventure Awaits" speaks to many adventure junkies. I love the gold letterings so much. 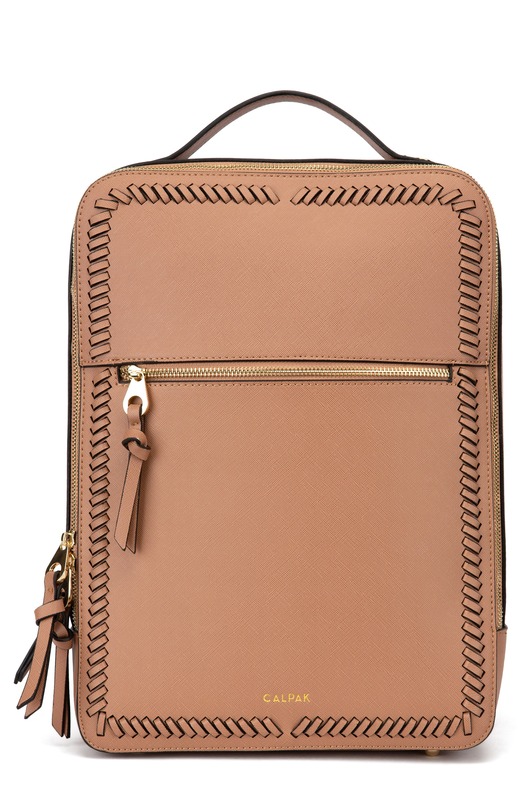 six // Two people have now raved about this Calpak Kaya Faux Leather 15-Inch Laptop Backpack to me this month. It fits tight, if you're a minimalist packer and don't require a lot of extra space. If packing a lot of items gives you anxiety, this is a great bag for you. Both gals I spoke with said it was a great travel bag for work but I think it's a great bag for when you're out and about in another country. I gives you enough space to buy spices and/or goodies from the market before heading back in the airbnb after a day of blogging. Haha! seven // The.Set.Is.Amazing! Honestly, these eye masks save lives. I am not a but person after 8 hours on a flight to Europe. I've accepted it. However, these Beautybio Bright Eyes eye masks bring baggy jet lagged eyes to a nice calming state. The cuter I look, the happier I feel and these work wonders. This set is a special holiday set and it includes 5 eye masks and an "offline" (cuteeeee) fabric eye mask for $25. Its a really great gift for someone who travels a bit. Also great for one too many glasses of wine with the girls. I hope you enjoyed my first Gift Guide set! I'm trying to get 2 out a week until Christmas. Not to worry, I thought of something for everyone, including your Dad and brother! I have a few gift guides from last year, feel free to check them out below!